Selenite crystals 12 meters long. Naica Mine, Mexico. Photographer unknown. Conventional geologists claim that water sculpts the interior of caves over eons of time. Could electricity have formed some of them in an instant? PreviousThunderbolts Picture of the Day articles have addressed the evidence for electrical scarring on Earth. We have suggested that many formations are not the result of geological forces acting on stone with slow, steady modification but are the result of massive plasma energies on a scale that defies convention. Electric arcs and glow-mode discharges may have excavated canyons, carved-out craters and pulled gigantic uplifts out of the ground, compressing them into features such as Shiprock and the Brandberg Massif. 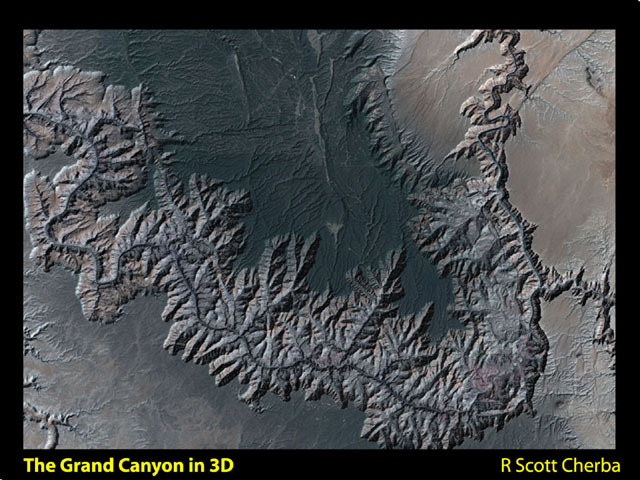 The same powerful strokes that may have carved the Grand Canyon out of living rock could have created other structures that are normally thought to be from liquid erosion: caves and caverns. As electric discharges pass through rock strata, they follow the path of greatest electrical conductivity. They sometimes leave extraordinary evidence of their passage in the form of Lichtenberg figures etched into soils and rocks. They are filamentary and feathery in appearance, with finely divided tendrils at their leading edges. The branching configuration results from the electric current dissipating as it travels through the material, seeking its most conductive pathway. 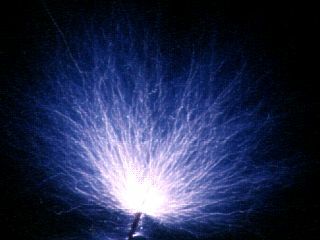 Another unique aspect to plasma is that it forms "tufts" and "blooms" of electricity as the current erupts out of the discharge electrode. Tufts can be seen in the "plasma sphere" devices that are marketed to the consumer. Of course, the most common example of a plasma discharge is a lightning bolt. Huge caverns are found everywhere on Earth. While it is true that soft limestone is easily dissolved by the weak carbonic acid solution that constitutes rainwater, the majority of caverns contain mineralogical samples that cannot be defined through the corrosive action of rain or flowing water, leaving open the possibility that some other force was involved. In the image at the top of the page an almost unbelievable demonstration of our primary hypothesis can be seen. 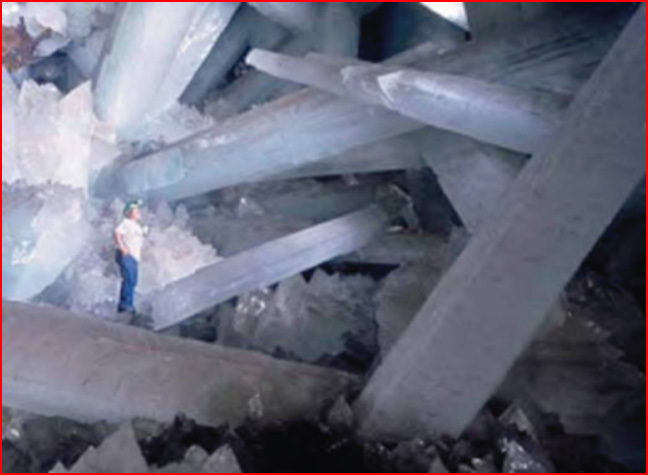 The recent discovery of Giant Crystals Cave in the Naica Mine of Chihuahua, Mexico has stunned scientists. The cave is filled with mineral deposits of enormous size, as well as with delicate flowers and wisps of crystal so fine that a breath will shatter them. The crystalline shapes are formed out of semiconductor materials: selenite, calcium carbonate, silicon dioxide and lead sulfides. The crystal matrix shown above is an example of the "spray" that might have been created when a powerful electric current exploded out of the rock face into a void beneath the surface. The nuclei of charged particles could have been carried along with the current flow and either ionized by the passage of electricity, or forced out of solution within the solid medium. The filaments of energy flew out of a central point and then crossed empty air seeking the path of least resistance, whereupon they continued into the stone, impacting at multiple locations. Wherever the electric arcs passed they left behind consolidated crystals condensed along their interior trackways. One significant aspect to Giant Crystals Cave is that it is bone dry, with little evidence to imply that it was melted out of the rock by flowing water. Coupled with the lack of moisture, we find nothing in traditional scientific theory that explains how water causes the precipitation of 12-meter crystals along all orthogonal axes. Jenolan Caves near Sydney, Australia is another instance where formations exist that are difficult to explain according to standard theories. Clear helicites grow everywhere with mind-boggling shapes that defy gravity. Some of the chambers within the cave complex are etched with Lichtenberg figures and upright columns of translucent gypsum crystal. 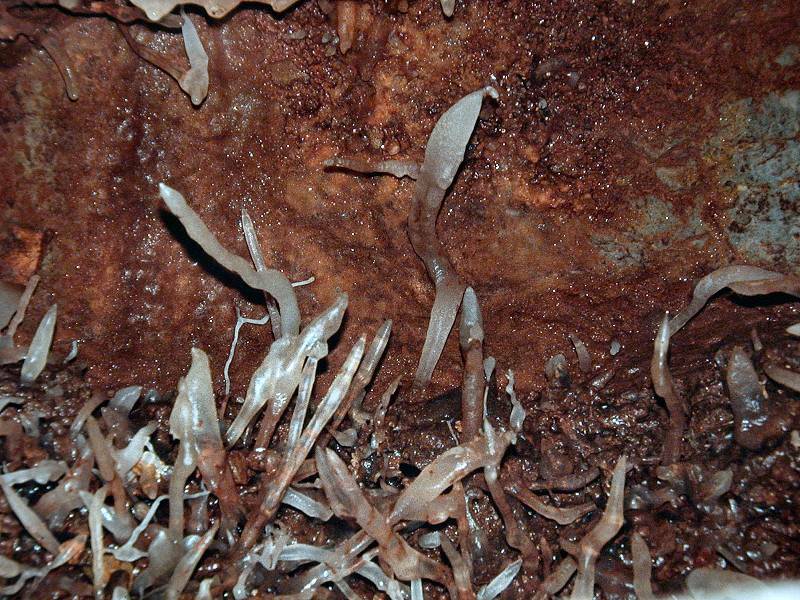 Fulgurites, or the fused trackway of lightning bolts through refractory minerals, are common in Jenolan and in most other caverns. 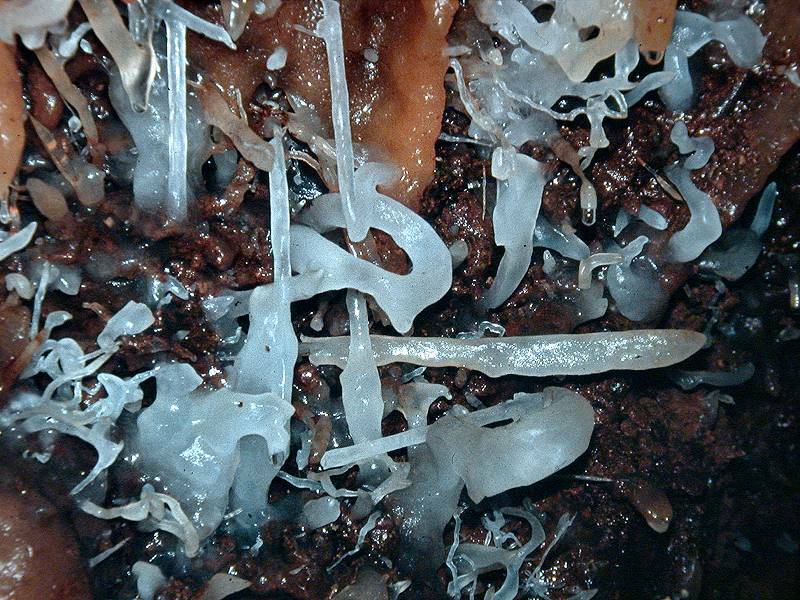 Could stalactites and stalagmites found therein actually be the remains of fulgurites? As we have suggested in the past, some geographical features, like rivers, may have "adopted" discharge channels after they were excavated by a plasma blast. Perhaps drops of water roll down stalactites after their formation as fulgurites? Lechuguilla Cave in New Mexico is filled with formations that are nearly identical to Jenolan and the Naica Mine. It is a moist cave, but the water flow is isolated and does not reach many areas where there are significant anomalies. Along the floor and up the walls in one of its vast rooms are thickets of gypsum blossoms like small crystal bushes. Merely walking too close is enough for them to collapse with tiny tinkling sounds. Lechuguilla possesses "boreholes" as well. One of the largest is a horizontal tunnel that penetrates for miles into the rock. The LeBarge borehole exhibits what Electric Universe theorists might call a helical shape - the sign of a spinning electric arc blasting out the material as it spiraled through the strata. In another part of Mexico is Sotano de las Golondrinas, or Cave of Swallows. It is a favorite place for B.A.S.E. (Buildings Antennas Spans Earth) jumpers because it is 875 meters deep. The Cave of Swallows is similar to the "skylights" that have been discovered on Mars. Electric arcs as lighting bolts are mainly vertical strikes. They are filaments of charged particles rotating around an empty center with multiple energetic strands. A lighting bolt averages 1.5 X 10^11 watts in a spilt second as it blisters through the air. They will sometimes form craters if they hit sufficiently conductive surfaces since they spin down into the material. If they hit a resistive layer, they will spread out and create shallow Lichtenberg figures. 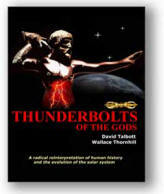 Since the Electric Universe model predicts electricity from space, could the holes, caverns, caves and tunnels we find here on Earth be the forensic evidence left by the "thunderbolts of the gods"?